One hundred and fifteen years ago, it was understood by one and all that finer homes deserved having a reed organ in their parlor. Sears didn’t need to explain why you’d want one. How else would you bring music into your household? Tinny-sounding horn gramophones were just making their way into a few houses. It would be decades before radios, LPs, CDs, and all subsequent music delivery systems enlivened our living rooms. 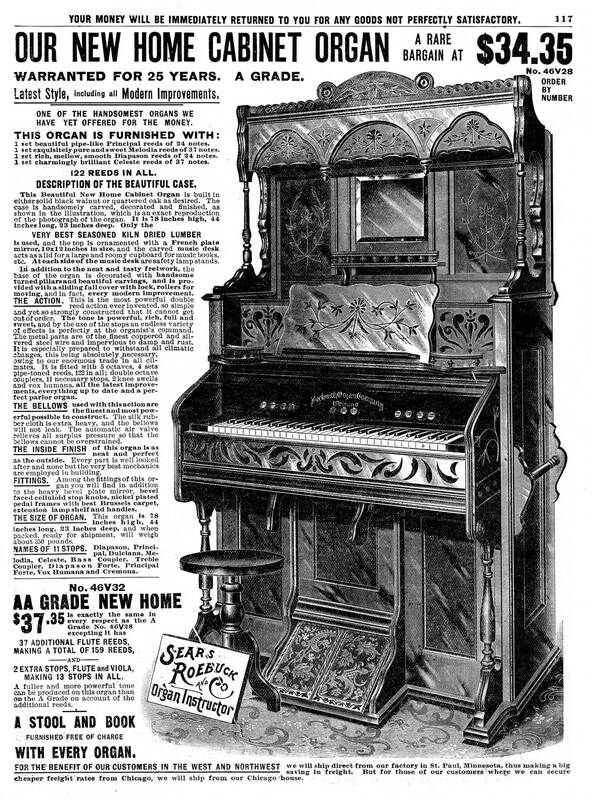 The 1903 Sears catalog listed twice as many organs as pianos, because organs were more versatile. With 11 (or even more) stops you had plenty of tonal variations. Plus, organ cabinets could be more ornate. In fact, the more ornate the better during the Victorian/Edwardian era. The New Home Cabinet Organ certainly looks over the top with its “neat and tasty fretwork” and “handsome turned pillars and beautiful carvings”, and the full page description goes over the top in describing both the cabinetry andthe inner workings. Zoom in and read: there are a lot of details. One hundred fifteen years later, this massive (350 pounds to ship! ), massively-decorated musical instrument no longer has a home. Few people play keyboards — or any other musical instrument at home for fun. $34.35 might be “a rare bargain,” but most of us now prefer our music recorded, streaming, and free. We're celebrating all the abundance and excitement found in vintage 20th century American catalogs: the exotic, the fashionable, the surprising, the latest, the coolest, the cheapest, the oddest, the choices. Not just Sears and Montgomery Wards, You could buy anything from a catalog in the 20th century: from a box of raisins to a house, from a computer to a car, from a billy club to an inflatable brassiere. The old-time printed catalogues which arrived in the mailbox showed the 20th-century American Consumer just how to consume.